Do exercises to improve the strength of our muscles and bones. Do exercises to help improve our balance and coordination. 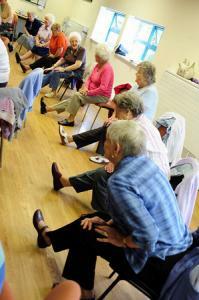 Strength and balance is considered to be one of the biggest interventions in reducing the risk of falls. All of the Strictly No Falling classes will include exercises to help you achieve these objectives. All of the staff working to deliver these sessions are well qualified and have been approved by the Falls Activity Advisors. These sessions are predominantly seated, but may include some optional standing exercises. If you are new to exercise and or feel that you are unsteady on your feet then these are the sessions for you. These sessions involve both CBE and some supported standing exercises using light ankle weights to improve lower body strength and balance. If you are generally steady on your feet or feel you need to progress from just seated exercises then these are the sessions for you. These classes include mainly standing strength and balance exercises using light ankle weights to improve lower body strength and balance with the possibility of some seated strength work. If you are steady on your feet or have completed a falls prevention session within your local falls clinic then these would be the sessions to choose. These classes include mainly standing strength and balance exercises with the possibility of some seated strength work. Exercises, including coping strategies and functional floor work will be included to help you return to your feet should you have a fall. If you are steady on your feet, have good mobility and have completed a falls prevention course within your local falls clinic then these would be the sessions to choose. T'ai chi is a Chinese exercise system that uses slow, smooth body movements to achieve a state of relaxation of both body and mind. If you have not had a fall and are generally active then this would be the best option for you to increase your strength and balance. If you are interested, please contact the Falls Prevention activity advisors who will be able to help. Call 01773 768240 or email administration@ageukderbyandderbyshire.org.uk. Please click on the link for a list of sessions in your local area. The Strictly No Falling Logo is only used to promote community exercise groups across Derbyshire and Derby City which deliver exercises that have been assessed as being suitable to reduce falls risk. You can be reassured that groups which display the Strictly No Falling logo have been visited by local Falls Prevention Activity Advisors, and assessed to ensure they meet certain minimum standards. While they have been assessed as delivering sessions which incorporate balance and strength exercises, Derbyshire County Council are not responsible for the individual sessions and do not employ the instructors. For this reason it is recommended that you satisfy yourself prior to commencing exercising that you are fit and able to exercise, the instructor has current personal liability insurance and is aware of and able to provide any individual support which you may require.